From Good Smile. 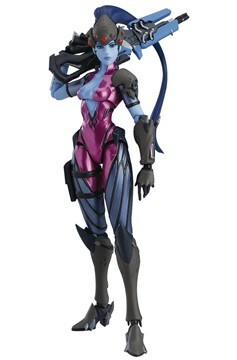 From the globally popular multiplayer first-person shooter Overwatch® comes a figma of Widowmaker! The smooth yet posable figma joints allow you to act out a variety of different scenes. A flexible plastic is used in specific areas, allowing proportions to be kept without compromising posability. She comes with both a standard glaring face plate as well as an aiming face plate looking through her scope. Widowmaker comes with both her Widow's Kiss sniper rifle as well as a venom mine part. The Widow's Kiss comes with interchangeable parts to switch between sniper mode and fully-automatic mode. A grappling hook part as well as alternate left arm firing the hook are included, and a wire is also included with the hook. She also comes with a closed version of her recon visor to pose her making use of Infra-sight. Also included is an articulated figma stand to facilitate various exciting poses..